Maybe you don´t like to share an information about your problems with someone else. Then self-healing should be considered. Autopathy is particularly suitable for it. We got much feedback about successful self-healing from people who never healed anyone before or even have not visited a course about autopathy. They have read my book or all they had was the following simplified description on how to start that is suitable especially for the beginning, before we deepen our knowledge about autopathy by reading the book Get well with autopathy or visit one of the courses, or before we consult a professional practitioner, or when we want to find out if autopathy “does anything”. We write in a special notice book or a block briefly all own current subjectively observed and perceived difficulties or problems of the psyche and the physical body. It is better not to make any diagnosis. We write each problem in a separate line, everything that you want to improve on ourselves. We note the date. In case we do not want to do this at all, we can leave this point out. We make and use the preparation at regular intervals, initially once a day or every other day. At the beginning in all cases a low potency (degree of dilution) be applied, made ​​of one and a half liters of water, which corresponds to a homeopathic dilution of 60 C and is prepared by pouring one bottle of an ordinary table water (not sparkling) through the autopathy bottle. It is advisable to prepare autopathic preparation in the autopathy bottle according to the instructions for boiled saliva. After fourteen days to one month we begin to experiment with intervals of applications. There is a complete freedom in the choice of the interval and we can fully rely on our feelings and intuition. We try an interval that suits us, after which we feel the best. For example, we will extend it from daily application to every second day or from every second day to once a week, or we shorten it from once a week to once in three days, or we can even take the preparation several times a day. We follow our feelings, our impressions and intuition. There is a great freedom and nothing bad will happen when we tentatively shorten or lengthen the intervals. We can always return to that, with which we felt best. Once the most suitable interval is found, we maintain it for a longer time, depending on the condition, maybe even months. We find for example that the effect passes on the third day and so we shorten the interval to two days. With continued application in long-term conditions the interval of one week had proved to be the best. If we notice that the problem improved, we can begin to prolong the interval. Eventually, but not earlier than in two weeks, we will increase the amount of water to dilute to 2-3 liters, depending on the degree of vitality and age. The very sick perhaps after a month or even longer (see 5th edition of Get well with Autopathy, chap. Potency or Degree of Dilution, page 35). Whenever it appears that the increase of dilution does not bring improvement, we return to the previous level of dilution. Good results in the management of long-term chronic problems were achieved through frequent repetition, even for the period of many months in long-term and deep-seated conditions. We are of course aware that the gradual tuning of the organism from a long-term dismal state needs a longer period of time before the problems gradually visibly improve or disappear. If this is not fully successful and obstacles arise, it is of course good to turn to an experienced advisor and use all the options that autopathy offers. In addition, there are two books dealing with self-healing in detail: Get well with Autopathy and also Autopathy, a Homeopathic Journey to Harmony. It is good to have the books in the library and reach out for them when doubts arise. 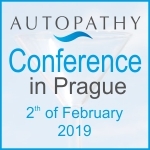 The philosophy and the method of classical homeopathic treatment that are fully implemented in autopathy are not quite simple, they are very different from common practice and for self-healing we should be familiar at least with the basics. If after some time, e.g. several weeks or months, we decide to again increase the amount of water (potency), we add each time only one liter and not more. The increased dose should be maintained for a long time. We adapt the interval to our feelings, but usually we take the preparation once a week. When there is some crisis, we can increase the frequency and return to the previous frequency after the crisis is over. If we reach the goals that we have set ourselves, that is: a significant improvement or elimination of long-term problem, we stop or we extend substantially the interval, for example to one or two months at the same level of dilution. When the removed or significantly improved problems reappear, we begin with the quantity of water and the interval that preceded the significant improvement. An original one liter bottle of distilled water can be used for accurate measurement of quantity. Pouring into measuring containers is not advisable as it could result in contamination of water through foreign matters in these vessels. We always pour the water into the autopathy bottle directly from the original packaging. Do not forget the expiration of the autopathy bottle in three months from the first use and replacing it with a new one, to avoid the disturbing effect of “memory of glass”. The potency may be over time increased still further, but always only by one to one and half liters and with multiple repetition of the same. Always with the option to return should the higher potency functions less than the previous lower one. Our guides are again our feelings, observation and intuition. We can sometimes look into our notice book and compare the initial state with the present one. We will see what has changed. We note the changes. During the regular production of the preparation carbon water filter that removes chlorine is of great help. It is mounted on the water tap in the bathroom and the funnel of the autopathy bottle is inserted under the stream of water from the filter. The water can run over. The quantity of water passing through the bottle is approximately one liter in half a minute = 40C, 2 liters in one minute = 80C, and 3 liters in one and a half minute, 120C. What just has been said does not change the fact that in more complex cases, counseling of a dedicated, experienced and objectively assessing person is very useful or even necessary. When we find after the experience with self-healing that we belong to this category, we always have an opportunity to contact a consultant. In serious conditions it is important that the consultant is involved from the beginning, however, also here the aim is a situation when the person concerned consults him less and less as his condition gradually improves. Finally, the client should be independent of the consultant. That there are also conditions that one can improve, but not cure, or even that cannot be improved, I do not need to remind of. It depends a lot on the vital force of the person concerned, on the hidden internal state which Buddhists call karma. Since the exclusion of other methods of treatment is not a condition for the autopathic treatment, there is no need to think about whether to give priority to this or to that. Autopathy can be used also as a complement to any other method. Autopathy can´t principally cause any harm.